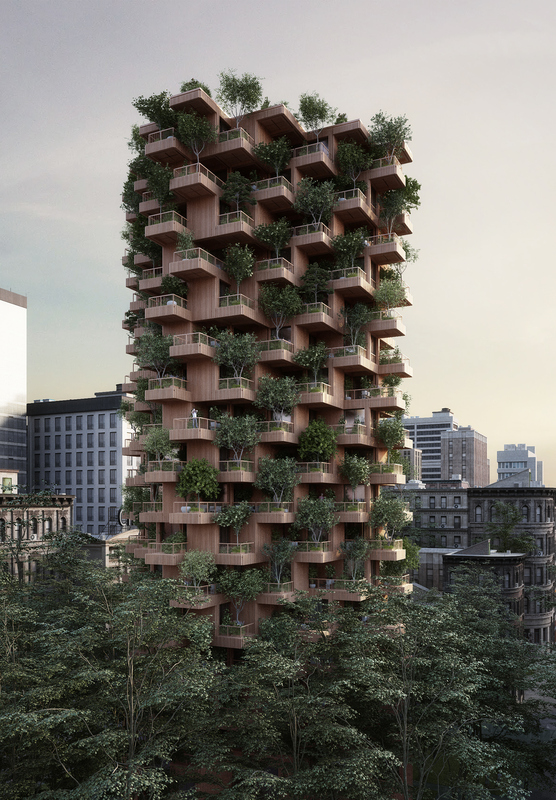 The ‘Tree Tower Toronto’ should be seen as a catalyst for future residential buildings that are ‘more efficient to construct’ and ‘more ecological to our environment’ than common construction methods. “Our cities are a assembly of steel, concrete and glass. 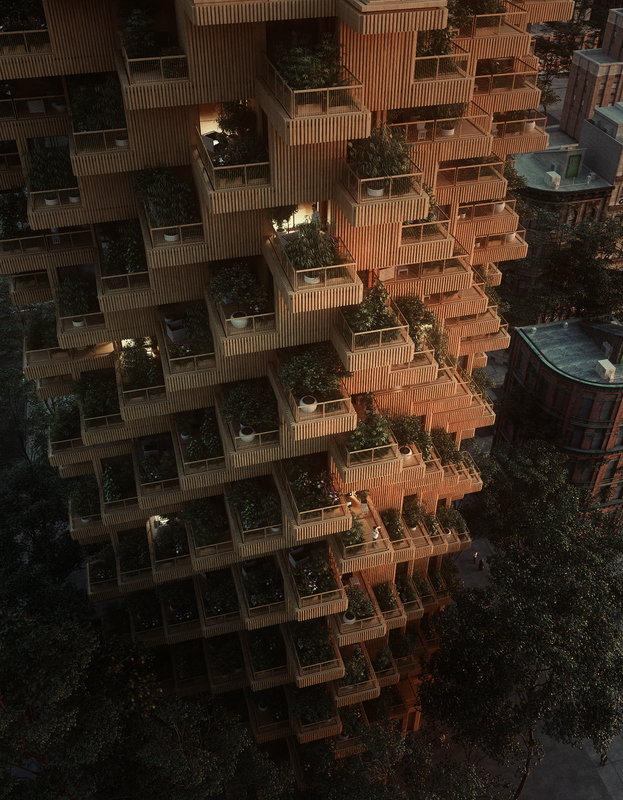 If you walk through the city and suddenly see a tower made of wood and plants, it will create an interesting contrast. 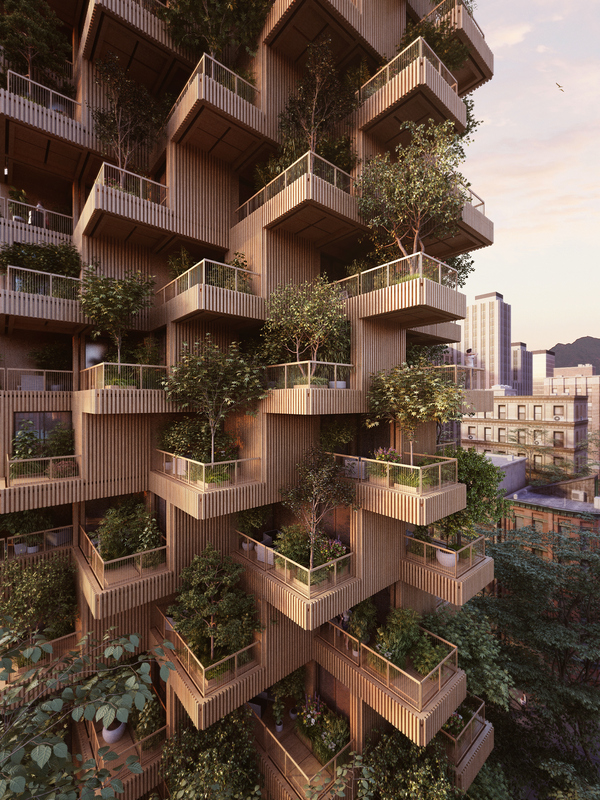 The warm, natural appearance of wood and the plants growing on its facade bring the building to life and that could be a model for environmental friendly developments and sustainable extensions of our urban landscape,” states Chris Precht, partner at penda. 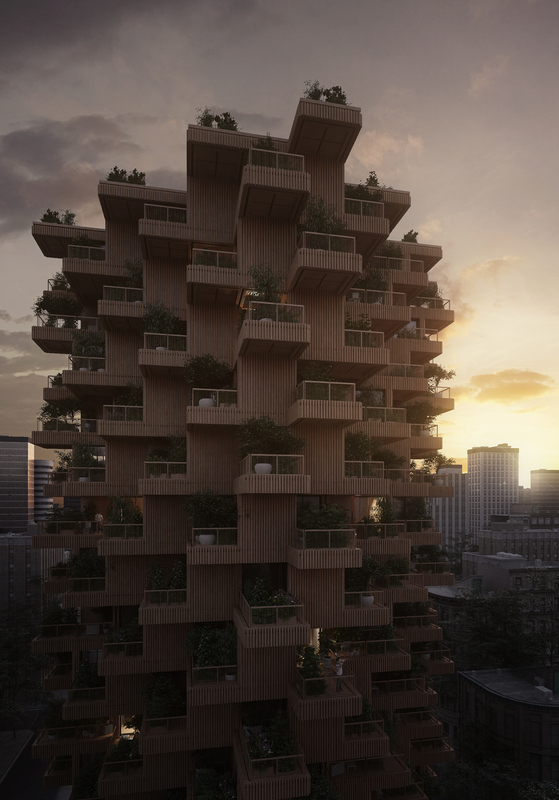 The ‘Tree Tower Toronto’ is a joined effort of ‘penda’ as architects and canadian CLT-consultancy ‘Tmber’ to envision a sustainable high-rise proposal in urban areas. The 18-storey tower will stand 62m high and will comprise 4500 sqm of residential areas and 550 sqm of public areas with a cafe, a children’s daycare-center and workshops for the neighboring community. Due to its natural appearance, the building shifts the usual relation from a ‘building to city’ relation to a ‘building to nature’ relation. 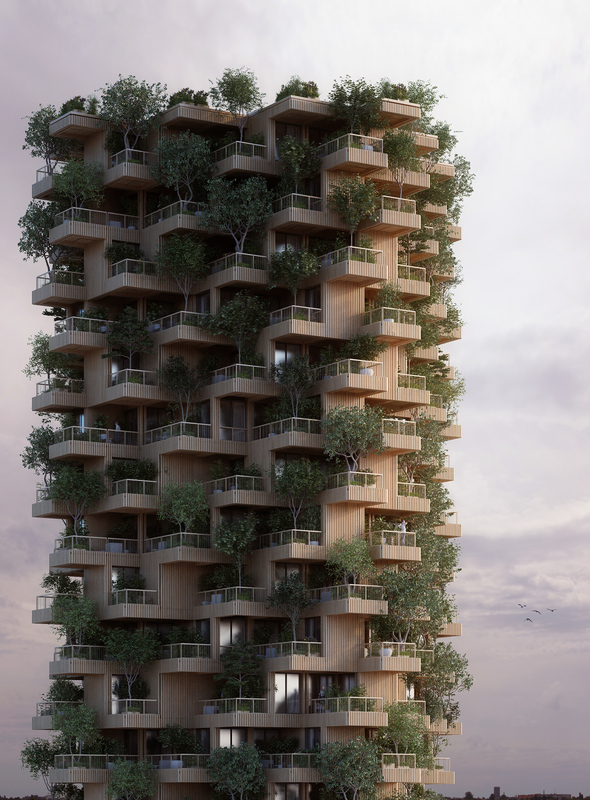 The tower tries to establish a direct connection to nature with plants and its natural materiality. 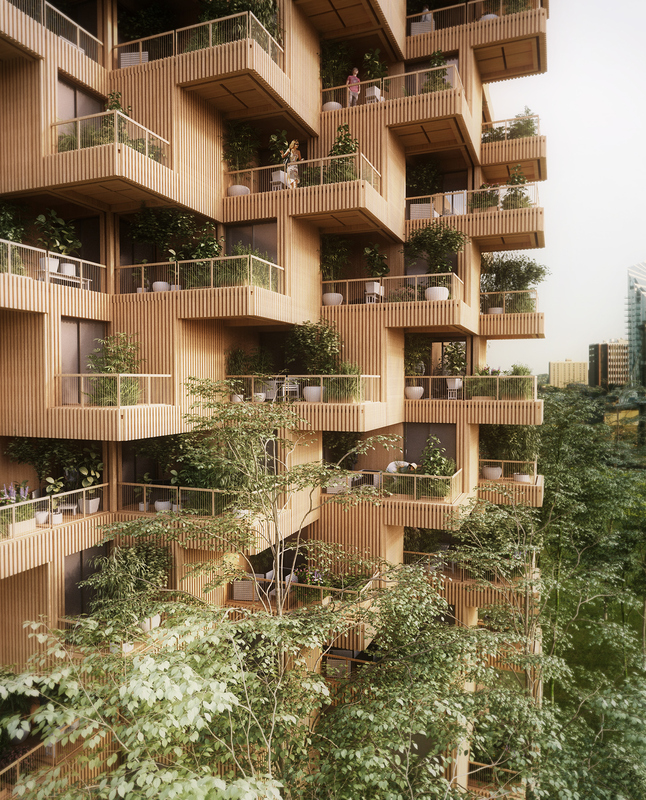 Canada has a long tradition of wood construction and was one of the first countries in the world to change their building codes in order to use wood in vertical structures. 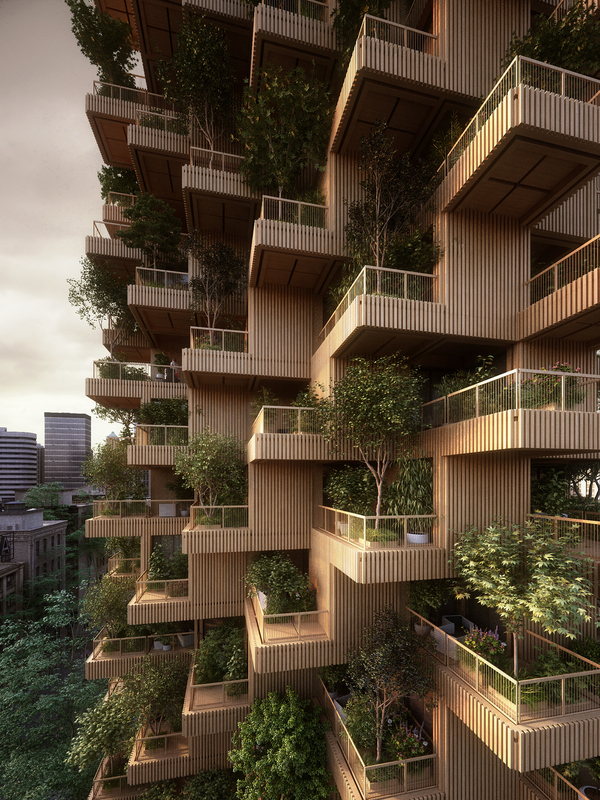 Therefor Canada is a pioneer in adding high-rises made out of wood to their urban fabrics. As a promotion for sustainable developments, the canadian government awards buildings that exceeds carbon footprint standards. 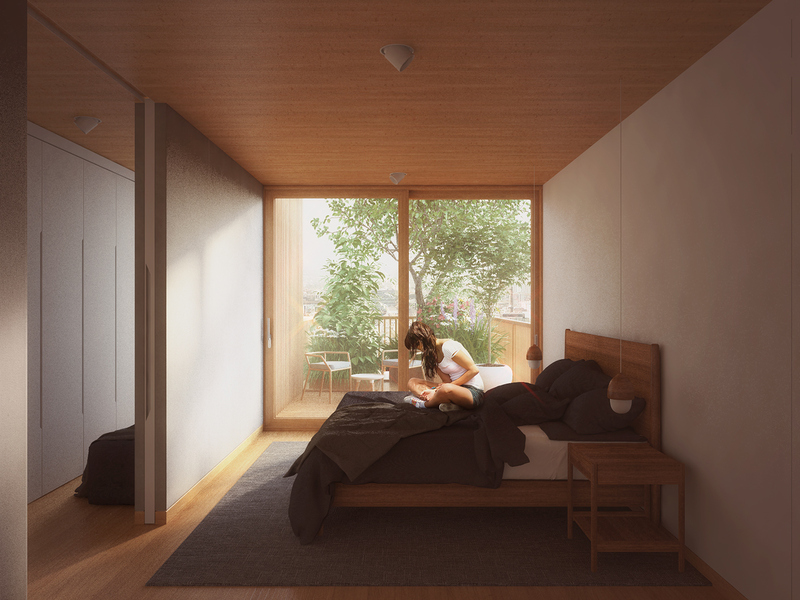 Such credits can reach a 10-20% funding of the building cost and is a direct injection to green-light sustainable housing proposals and are an incentive for forward thinking developers. Canada was also a forerunner for a modular, prefabricated construction which was efficient on one hand and visually interesting on the other. One great example for this process is Moshe Safdie’s Habitat 67. 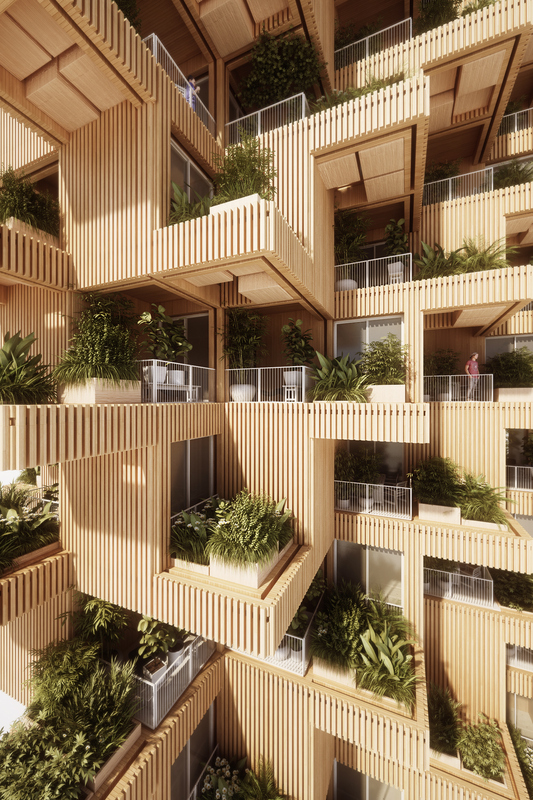 Inspired by the Habitat, The ‘Tree Tower’ is using a modular building process, where pre-fabricated and pre-cut CLT panels are assembled to modules off-site at an indoor facility. After the work on site, with foundation, ground floor and a base core is done, all modules include fixtures and finishes are delivered to the site and craned into place. During the process of stacking the modules, the timber clad facade panels are installed and sealed. To go fully modular and prefab, the process is faster, less noisy, reduces waste and allows for a high degree of quality control as most parts of the building are assembled in a controlled indoor environment. 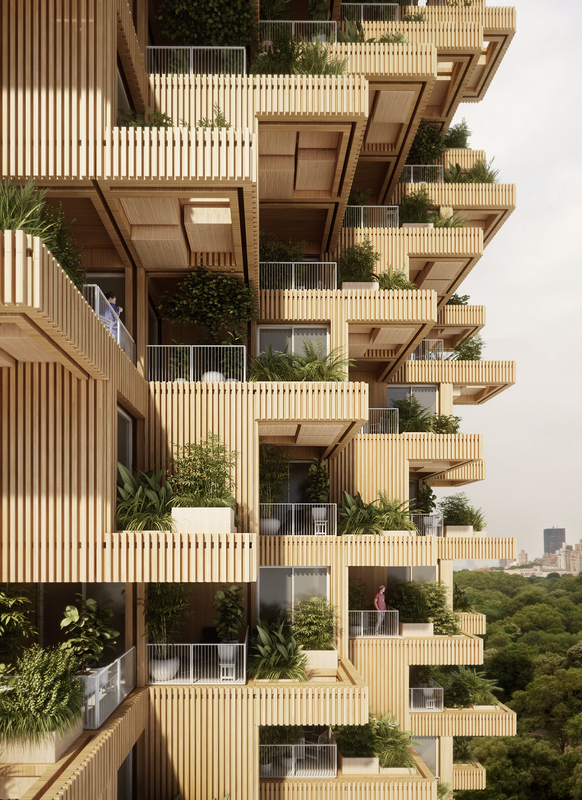 The structure of the building is mainly massive timber panels with a hybrid of CLT, concrete and steel-elements where needed and can be seen as a prominent statement to use engineered wood products in vertical structures. Furthermore the modular construction systems implements already an idea about the re-usability of building components in an after-life of a tower. Elements of a building like wires and copper will be a scarce resources in future. To demolish a tower in an conventional way, buries most valuable elements of a building. 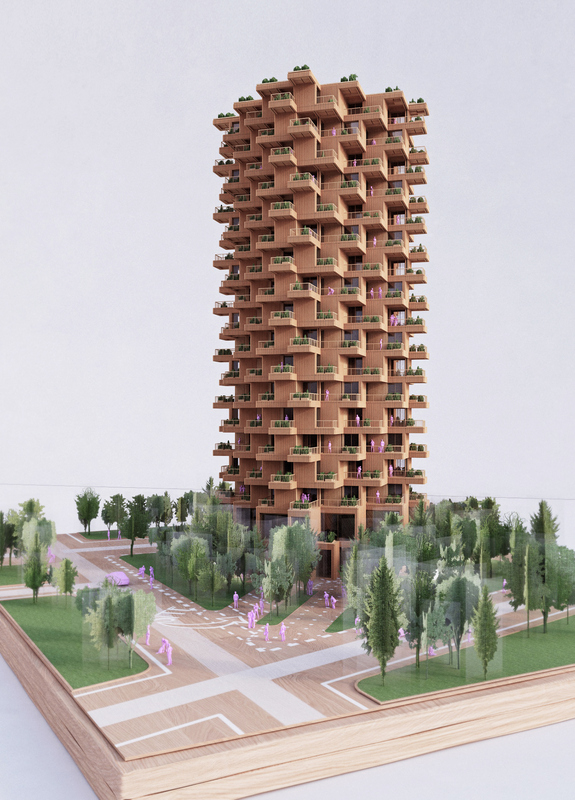 To think about down- constructing a tower secures for a sustainable life-cycle of a building. Wood is an old building material that has been getting a new life in taller buildings over the last five years by mass timber products. 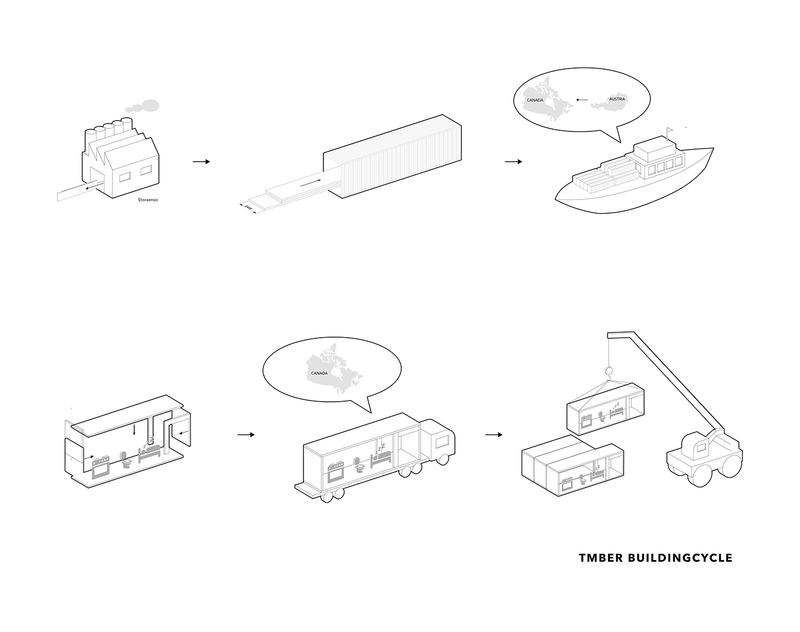 Building with engineered wood has been called the next tidal wave of building in the 21st century. A quality living means living in healthy environments. That also means living in an healthy city. The building industry is by far the biggest contributor to pollution on our globe and solutions for more ecological buildings need to be actively sought and legislated. Because buildings account for almost half of all energy used worldwide, the quintessential focus of the design community has to be on strategies to reduce the energy consumption in buildings and in their construction. 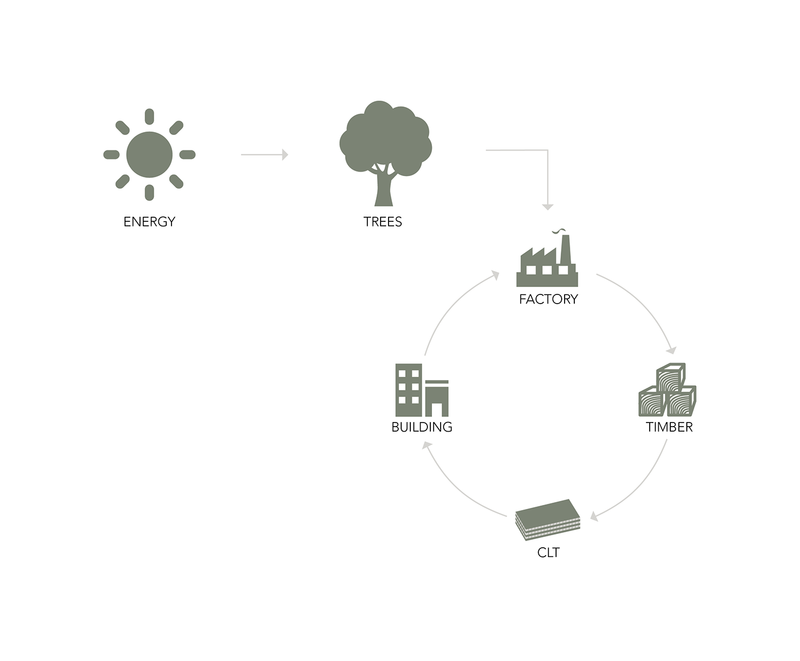 The process that creates structural engineered wood products takes far less energy than steel, cement or concrete and produces fewer greenhouse gases during manufacturing. Further, wood stores carbon in itself (approximately one tone per cubic meter) thus it has, compared to other building materials, a lighter overall environmental footprint. Key element of the project is to communicate the project’s innovative use of wood and engineered wood technology used in the building. 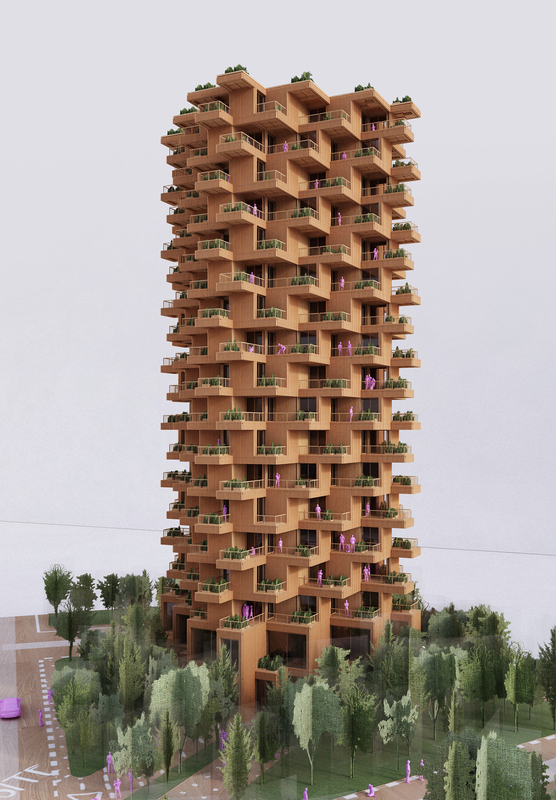 The tower is not only using massive wood panels as its main structural element, but has also timber clad panels as its facade. 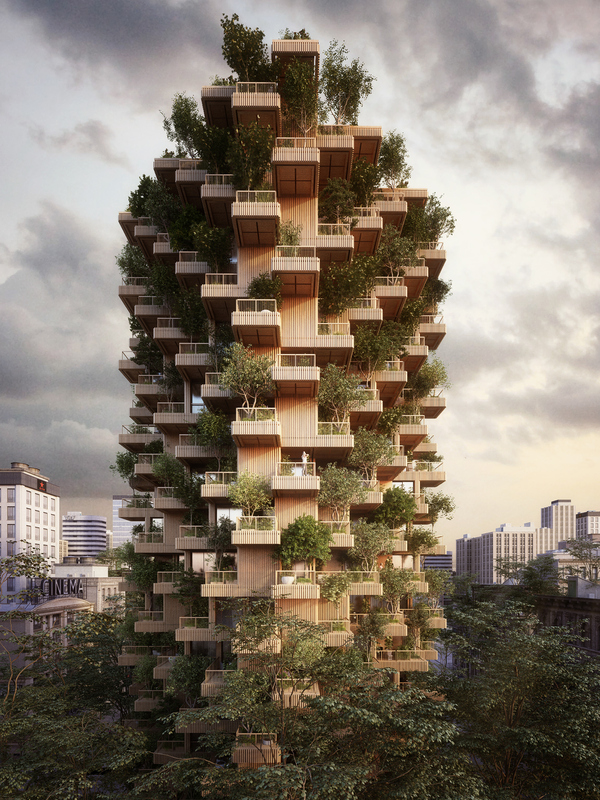 Despite wood as a structural and cladding material, trees and plants are also a key component on the buildings facade. Large out-door areas provide a space for herb and vegetable planters for the residents. 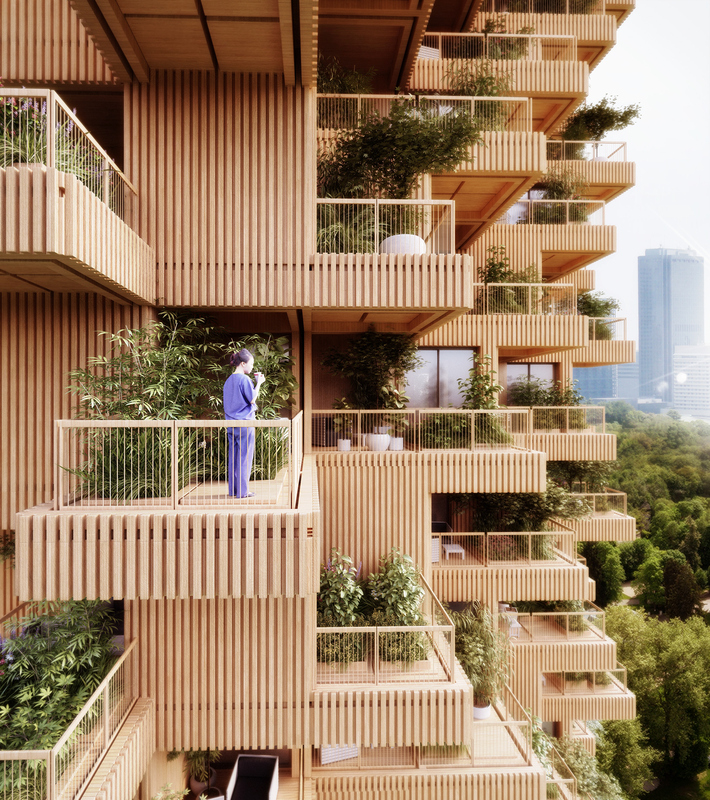 The botany on the terraces offer a private garden for each apartments, which creates a certain degree of privacy within the density of the city. The trees also provide a shade in summer and helps to keep the temperature low on warm days.